Every business to business transaction is a symbiotic one. When one business does work for another, the provider’s reputation is as much under scrutiny as the receiver’s business is dependent on proficient service. For example, if a delivery business has a problem with its computer system, its whole operation is in jeopardy. Unless the delivery company can get the problem fixed, deliveries will fail, customers will not receive their goods on time, and compensation may have to be paid out, meaning unnecessary costs. Ideally, the company wants the problem to be fixed before its customers are even aware or affected. On the other side of the equation, if the IT specialists who are called out to fix the problem do not provide a prompt and thorough service, they are unlikely to be called out again, meaning loss of business for the IT support company. Ideally, the technicians should be trying to ensure that their company gets repeat business and, even more importantly, a recommendation to attract other potential customers. By inviting their customers to rate their services, an IT service company makes itself 100% accountable. Following the reach of 10,000 IT users in April this year, Telx Computers, a leading provider of IT support Miami, announces the opportunity for businesses to rate every IT technician, ensuring high quality service and the best results for all. IT technicians can be rated on aspects such as overall knowledge, their demeanor, their ability to communicate, and their response time. Because of this ability to rate technicians, businesses reliant on computer support Miami know that Telx Computers is a company they can rely on for fast response and the highest quality service. One of the most important aspects of computer services is a technician’s ability to explain exactly what the problem is before they go ahead and fix it. The customer needs to know what they are paying for. Similar to getting a car fixed, when a mechanic should explain the problem before fixing it, computer technicians should always explain the issue to the customer before dealing with it. 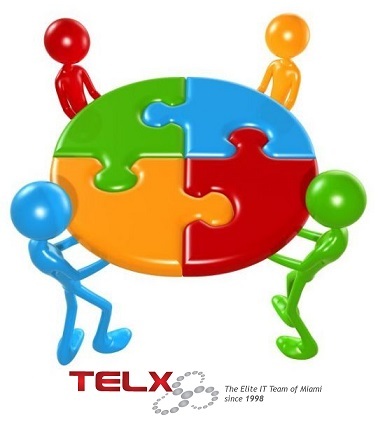 Telx Computer technicians are aware that they are leaders in Miami computer repair when it comes to communication. It is their responsibility to ensure that they have given a full description of the problem and that the customer has comprehended the nature of the repairs. It is for this reason that businesses using IT companies in Miami come back to Telx Computers time and time again. Business owners know that they can rely on Telx Computer technicians, thus they are reassured that there will be no disruption to their services due to computer problems. They are confident that, when problems occur, they can call Telx Computers to provide prompt and expert service. About Telx Computers: Telx Computers is a company dedicated to providing the best IT services Miami. For more information call toll free: 1.800.MY TELX 4 (698.3594), or join us for a live chat by visiting telxcomputers.com.